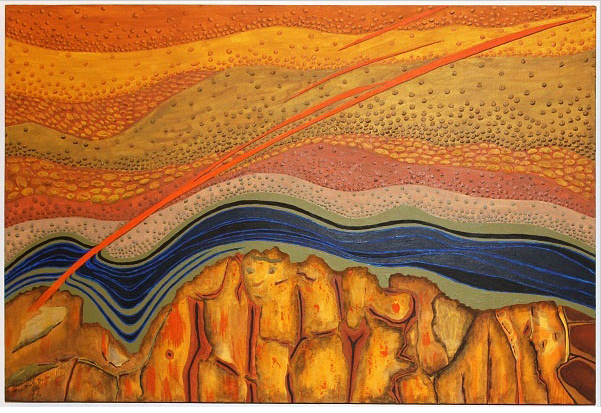 Last week I received an e-mail about a recent exhibit showcasing art inspired by Earth science. It was at the Two Wall Gallery in Washington state in November 2009 and called “Geo Sapiens”. You can read all about the event on this website and view the art as well as photos from the opening. Here are just a few of the many in the online gallery that popped out to me (descriptions beneath image from their website). Road Cutting at Charlwood by John Jackson — A petroleum industry professional with over 39 years experience in most all aspects of the industry worldwide, John is also a well-known geological artist who uses his artistic skills to promote earth science education and geotourism. A prolific painter since 1995, John’s original concept was to use his paintings to educate people on specific topics. Since then, his concept has evolved and expanded to the point that his works have been used to educate private and public groups around the world, including such groups as tourists in southeast Queensland, seminar attendees in Africa, and a collection of diverse tribal interests in Uganda. Also known as “The Rock Doctor”, John is first a geologist and second an educator who uses his art to convey his message. Net Pay No. 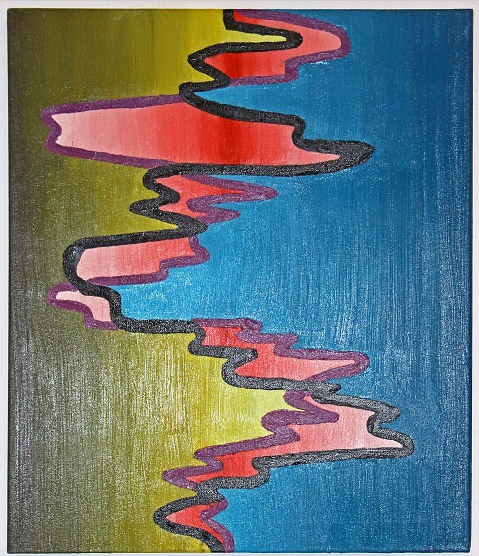 1 by C. Mark Wallis — Originally from the heart of Arizona and educated as a geologist, Mark now resides in New Zealand. It is here that he is inspired by the natural beauty and native culture to create vivid images that speak out to each observer. Using his experience as a geoscientist, Mark is able to blend natural geologic features into his art. Anxious Times by Jordan Stead — Jordan is a native of St. John’s, where she is a geophysicist with the Canada-Newfoundland and Labrador Petroleum Board. Jordan began painting five years ago under the guidance of Canadian artist Ed Roche, and has participated in several local exhibitions hosted by his art school. Her artistic talent was recognized by the Ed Roche School of Art in 2005 when she received the Best New Artist Award, and again in 2008 with the Best in Show Award. We plan to host another exhibit of work done by geoscientists, Geo sapiens II, later this year. In addition, we hope to coordinate similar shows at other sites across the country and possibly overseas at about the same time, and so we invite you to help with that effort and assist with the advertising and organization of geo-art shows in your neighborhood. If you are interested in participating and helping with an exhibit in your neighborhood, let me know and we’ll share ideas. I can say from personal experience that it’s a LOT of fun and not nearly as much work as it seems. And you get to meet a mess of people in your profession and have a few beers with them! What could be better than that? If you are interested in getting in touch with them, they have a ‘contact us’ page on their website here. note: Rebecca over at Dinochick Blogs must have received the same e-mail I did about this exhibit. Thanks for sharing this. I know some geo folks who might be interested, so I’ll be passing this info along!